Whatever your take on the revival in old school extreme metal, nights like tonight are making its impact on the underground difficult to ignore. For a rainy Sunday to see a venue the size of The Dome nearly full for bands as nasty as this, where the headliner still hasn’t got their debut album out, is highly impressive. Sadly, Dysangelium  can’t quite capitalise on the opportunity, suffering from a sound mix that’s all drums and not enough guitars, and a stage presence that is static without being imposing (and looks like Watain on a budget). Focus really hard and you can just about hear some decent black metal trying to jump out, but the still-assembling crowd’s attention understandably wanders. Vassafor  are better, actually managing to hold the attention with their noxious, malevolent black metal, and the room taps its toes along politely. That said, the enthusiasm never quite bubbles above polite, with the band lacking quite enough charisma to fix your eyes on them for their entire show – unlike Deströyer 666 , who have every eye on them the whole time they are on the stage. 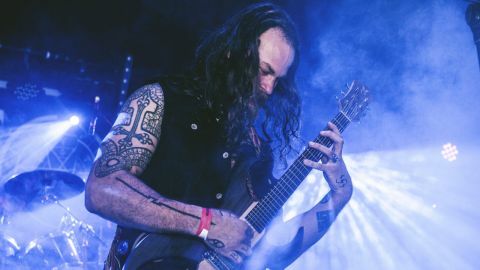 The blackthrash assault is about as pure a distillation of heavy metal as it’s possible to get, and the chugging, broiling fury they play is positively thrilling. Small wonder, then, that the set survives the mid-show delay when KK Warslut’s guitar conks out entirely. Fun as hell. Ascension , whose blackened faces lurk menacingly in the gloom on stage, glowering out at an audience surely pleased they stuck around, as the Germans put on a properly frightening display that rightly justifies the buzz around them, creating an oppressive, suffocating atmosphere of evil with their rawly majestic black metal. They are, however, outshone by Bölzer , who are a prime example of hype being justified. The two-piece may have less than an hour of recorded music available, but they can put on show that the best metal bands around would struggle to match – no mean feat given the simplicity of the visual performance. KzR adopts the Lemmy pose at the front of the stage and simply plays, while HzR hides in the dark behind his kit and whacks out thunder. And yet it’s riveting, and allows the vicious riffing to command full attention, the band’s distinct personality coming across with ease. It’s frightening to think how brilliant they might be with more songs available.